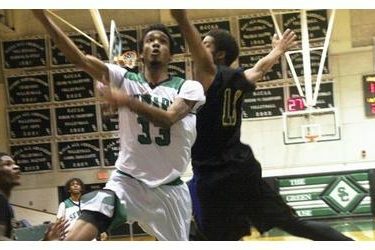 he #15 Seward County Saints looked like a completely different team on Saturday night in the Greenhouse as they took on the Frank Phillips Plainsmen to wrap up the 2014 Billy’s/Days Inn Classic. After shooting under 40% in their first five games, leading to a 1-4 start, the Saints torched the nets for 62% shooting on Saturday against the Plainsmen, needing all 101 points they scored on the night as they hung on to knock off 5-1 Frank Phillips 101-96. It was an up and down pace for the two teams early on, but unfortunately for Seward, their 13 points in the first seven minutes of action weren’t near enough as Frank Phillips raced out to a 21-13 lead. The Saints continued to play at a pace that they were relatively unaccustomed to thus far this season and were able to hang around with the Plainsmen to the 6:00 mark when back to back finishes at the rim by Kevin Sims and a big dunk by Tykwan Garner gave the Saints their first lead at 33-30. It remained a one possession game either way for the rest of the half where Seward was able to carry a 41-40 lead into the break. The Saints shot 53% from the field in the half while Frank Phillips shot 43%, both teams were on fire from downtown where the Plainsmen connected on 7 of 12, good for 58% and Seward hit 3 of 8, equaling 44%. The turning point in the game came early in the second half when big man Jamal Poplar stepped outside and canned a big three pointer for the Saints from the top of the key to put them up five and consequently sent Seward on a 12-2 run to give them their largest lead of the night at 61-49 with just under 12:00 to go. Seward continued to keep their distance from the high powered Plainsmen and a pair of Secean Johnson free throws pushed the Saint lead to 72-57 with 9:00 left. A Frank three and a miss on the Saints end of the floor slowly shifted momentum to the Plainsmen and just 2:32 later, it was just a six point game at 75-69. A bucket from Poplar stopped the Frank Phillips run and a controversial no call on the Plainsmen side of the floor ended up turning into a six point swing for the Saints after a technical foul on the Frank bench to put the Saints back up double digits. Seward looked like they had the game in hand, up 14 with just 4:52 left, but Frank Phillips began to turn up the pressure and the Saints had trouble handling it as a number of turnovers turned into Plainsmen points and before the Saints knew it, their lead was down to just 2 at 86-84 with 3:47 remaining. The Saints lead narrowed to just one before a key old fashioned three point play by Johnson pushed the advantage back to four and Seward did just enough down the stretch to hang on to win 101-96 for their second straight victory. Playing their most up-tempo basketball of the season, Seward shot a blazing 75% in the second half to finish the game at 62% overall from the field. To put it in prospective, the Saints top two shooting nights combined to this point of the time equal just 77%. The Saints were also on point from deep where they hit 9 three’s and shot 60%, matching their total three point makes from the last three games combined. Poplar broke out of his shell in a big way for Seward, scoring a career high 28 points and also pulling down a team best 7 rebounds in the win. Johnson pitched in 19 for Seward while Sims went for 17 and Evan Allen and Tyreke Sharp each contributed 11 off the bench. The Saints improve to 2-4 on the year with the victory while Frank Phillips goes down for just the second time, falling to 5-2. Seward’s tough schedule to start to 2014 will continue next weekend when they travel to Levelland, Texas to take on New Mexico Military as well as the host team, #3 South Plains.